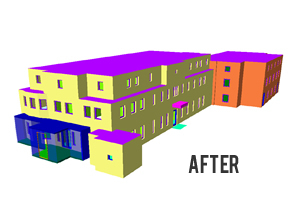 We offer the facility of carrying out Dynamic Thermal Simulation of buildings in-house. Con-Serv Ltd operate TAS software produced by Environmental Design Solutions Ltd.
TAS is a complete solution for the thermal simulation of new or existing buildings, allowing design professionals to compare alternative heating/cooling strategies and façade design for comfort, equipment sizing, energy demand and Part L2. 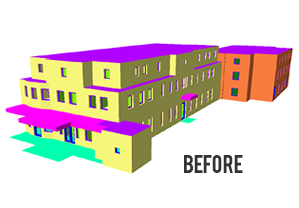 Using this software at the design stage, allows us to simulate realistic conditions to determine the thermal performance of a building and enables us to design the building services systems appropriately. This 300 year old 4 star boutique hotel in Wimbledon has 46 individually designed bedrooms. In order to create more internal dining space and to maximise the view out onto the garden area, it was proposed to enclose an existing ornate portico adjacent to the dining room, with a glazed façade and to provide heating to the space.